Architect and "Not So Big" life style visionary Sarah Susanka says when it comes to green remodeling it's not only about sustainability, energy efficiency and durability, but also innate beauty and the appropriateness in size. Here's how to make homes more comfortable, functional and sustainable through green remodeling or "regreening." Deadline Newsroom - A decade ago, architect and "Not So Big" life style visionary Sarah Susanka started up the road to guru status with a blueprint for living that extolled the values of living responsibly, sustainably and meaningfully. Susanka nearly single-handedly, revolutionized the way people think about where they live while prompting others to trade in the bigger-is-better approach for a livability-is-larger mantra. The true feeling of home, she said from the beginning, is not about the kind of emotional lust that put the economy in a tailspin, but the need to tailor a home to fit the human form and the need to scale a house in proportions that serve real human functions. Your house, truly should be your home, not a box stamped -- inside and out -- from a cookie cutter assembly line. 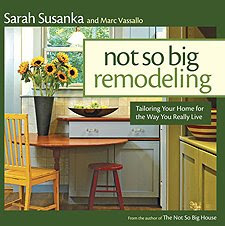 Today she sheds that same light on making homes more comfortable, functional and sustainable through green remodeling. durability, but also innate beauty and the appropriateness in size. Susanka says a house that fits its inhabitants in both form and function is a sustainable home because it is more likely be well cared for by its residents. Here's how to go green when remodeling the "No So Big" way.  Give your home the once over. Obtain an energy audit from a home energy expert to identify problem areas and pinpoint areas that need energy efficient improvements.  Tighten the ship. Get a heating, ventilation and air conditioning (HVAC) contractor's check up. Seal major air leaks identified by the energy audit, replace defective or substandard ductwork and seal all ductwork.  Tighten it more. Increase the level of insulation in the house especially in attics and crawl spaces. Choose from sprayed-in, closed-cell and Volatile Organic Compounds-free (VOC) foam insulations that can achieve a high insulation value even in small stud or rafter cavities.  Weight didn't break the wagon, waste did. Reuse original components from the home. Recycle items that can't be reused. Repurpose materials, such as grinding up old stucco for the driveway base.  Be a good Material Girl...or Boy. Choose VOC-free paints and varnishes. Seek engineered wood products and Forestry Stewardship Council-certified (FSC) woods, as well as carpet made from natural fibers such as wool.  Improve energy efficiency. To increase efficiency and lower bills, install the latest, most efficient HVAC equipment, using double or triple-paned windows with reflective coating. Select EnergyStar rated appliances. Install newer low-flow, dual flush toilets that flush once for liquids and twice for solid waste.  Top off improvements with a green roof. Extend the roof overhangs to protect the exterior from weather and shade the house from the high summer sun. Install solar equipment on a roof area with unobstructed, south-facing access to sunlight.  One beats a zero. Include as many green upgrades as possible when remodeling, but if it all seems overwhelming, choose one and do it well. One small green step for each home, is one collective green step for the planet. Simply changing the furnace filter once a month is one of those small steps.